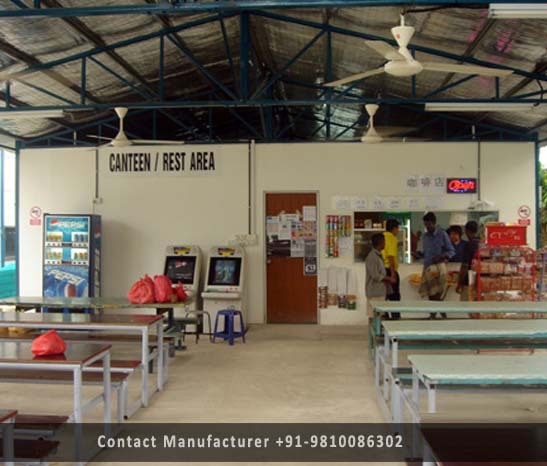 Prefab Labour Canteen Manufacturer in Delhi, Prefab Labour Canteen Supplier in Delhi, Prefab Labour Canteen in Delhi. Whether you need a simple mess room or a good spacious restaurant on site location, we provide a wide range of Prefabricated Labour Canteen that gives you the flexibility & feasibility to create hygienic and fully equipped catering facilities. These Prefabricated Labour Canteen are mainly used in the construction sector, for storing stock food products, preparing meals, proper distribution to the workers & staffs and also as a place to relax for some time. The offered canteen structures include light gauge steel framing structure and insulated panels that have non CFC PUF/EPS foam sandwiched between two structured boards. Moreover, these structures have doors, windows, plumbing fittings, proper natural daylight incoming & ventilation facilities etc. The main benefit with these prefabricated labour canteens is that these can be easily dismantled, relocated and erected at some other place once the project is completed.